Recently, a Miami artist intentionally lifted a Chinese artist’s vase from an exhibit at an art museum in that city and dropped it on the floor, shattering the piece. He committed the destructive act in protest of the museum’s practice of only displaying international art. Earlier this month, a French museum employee sat on a red leather folding chair that had belonged to Napoleon and broke it. True story: graduate students in a program at a much-venerated East coast museum spied a museum historian and registrar embracing after hours on an 18th-century 4-poster bed sometime in the late 1960s. Since both staff members proceeded to have long careers there, and grad students kept coming, the story continued to be passed along for at least 30 years. Rumor: a rather large male costume and textile curator tried on women’s undergarments from the collection while working late. These colorful examples of mishandling remind us that human nature is imperfect; that familiarity breeds complacency; and that accountability helps us all do the best job we can. Another reminder is that no matter what protections we put in place to keep artifacts safe, someone (out of thousands or more?) may put his own personal agenda above the responsibility to protect the artifact for perpetuity. What can we do to protect collections from insiders who may believe themselves to be exempt from usual handling limitations? One answer is to require collections work to be on a buddy system, although that guideline clearly would not have prevented the 4-poster bed scenario. In addition to being an added security measure, the buddy system has practical benefits by ensuring more man and woman power when oversize objects and large boxes may need relocation. Another answer may be to limit after-hours work in collections storage. What works at your institution? Have you tried security cameras as a solution? Or has the honor system been enough protection so far? Our Connecting to Collections colleagues in Illinois passed on an interesting tip several years ago in a webinar they produced entitled, “Preservation Tactics on a Shoestring Budget.” Of several great suggestions, the one which caught our attention the most was the use of polyester fleece as a preservation-appropriate fabric for covering mounts for both storage and display. To view the webinar, click here; to target the fleece suggestion, scroll to 35.05. Fleece makes a good option for several reasons. The material is affordable, often on sale for approximately $5.00/ yard. Its soft texture will help protect an artifact from an otherwise abrasive mount surface, such as cut ethafoam. Its stretchy texture makes it possible to tuck into slits cut into ethafoam blocks, consequently avoiding the use of adhesives. The fabric comes in a variety of colors that could enhance various exhibit designs. A couple of concerns, however, made us hesitant to recommend the material widely for storage and display mounts. First of all, manufactured polyester materials often have resins or chemical finishes that may be harmful to artifacts. Secondly, we’re trained to be leery of colored fabrics around artifacts. To learn more about the preservation-appropriateness of polyester fleece, we corresponded with Margaret Geiss-Mooney, Textile/Costume Conservator & Collections Management Consultant. To guard against the dangers imposed by resins and possible chemical finishing agents, Geiss-Mooney recommends that before use, the fleece be “machine rinsed (in good-to-excellent quality water) and dried (in a dryer that has never had fabric softener sheets used in it OR line dried).” She also cautions that fleece, with its fuzzy texture, is only appropriate as a mount cover for contact with artifact surfaces that are fairly stable, i.e. neither brittle nor fragile. Geiss-Mooney also notes that most fleece is a knit fabric and warns against its use in a vertical orientation for display mounts, because knits are prone to sagging over time. Use on a slant board “most likely would depend on the angle of the slant and the size of the display mount.” She suggests that acrylic fiber can also be considered as a mount cover with the same caveats in mind. The pigment does not compromise the preservation-appropriateness of the fleece. Unlike cottons, which are often colored with water-based dyes that can easily bleed, pigmented polyesters are usually safe. Geiss-Mooney explains that “the color is put in the melt and so when the solution is then extruded to form the fibres, the pigment is locked inside the fibres.” She recommends white for storage mounts to aid in visual inspections. Most pest debris or small artifact fragments will show up clearly on a white mount. A light grey color serves the same purpose for white artifacts. For more ideas on mounting materials that are safe to use with artifacts, check out this NPS Conserve O Gram. Geiss-Mooney generously offers to discuss this topic further with any readers who may have questions or need further clarification. Contact meg@textileconservator.com or 707-763-8694. Thanks also to NCMOH Textile Conservator, Paige Myers, for her contributions to this post. At last week’s Collections Care workshop in Charlotte, organized by the Mecklenburg Historical Association, one of our participants asked a great question. She explained that her organization maintains a log cabin with no environmental controls. When possible, she has replaced old objects with reproductions, but there are still many antiques at the site. 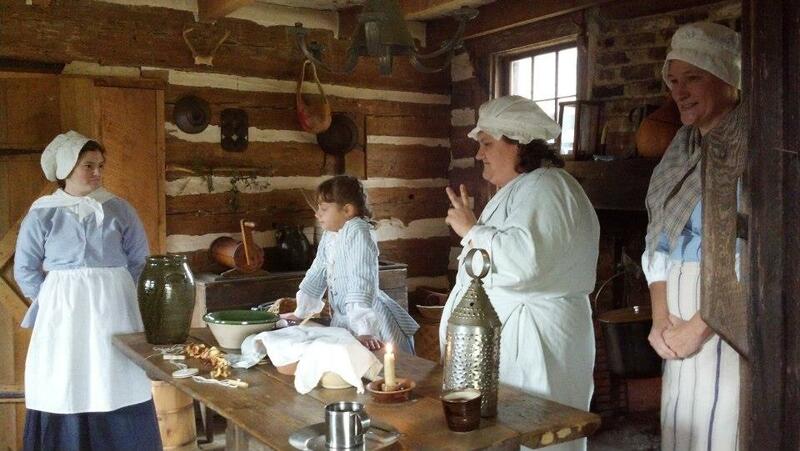 Interpreters and visitors handle and use some of these in demonstrations of blacksmithing, cooking, and more. What should she do? Coincidentally, this same question came up last week on the Connecting to Collections online discussion forum. According to Museum Consultant Ron Kley, “This has long been a topic of discussion…There is general agreement in the field that the use of original period artifacts in such circumstances is ultimately consumptive, and that the use of replicas is…preferred.” Kley also notes “persuasive counter-arguments…that certain artifacts — machines in general being a good example — are [better off] through prudent use with appropriate maintenance rather than sitting in storage under ‘benign neglect’ conditions.” Kley recommends ALHFAM, the Association for Living History, Farm and Agricultural Museums, as a good resource to learn more about this issue and to gather supply sources for suitable reproductions. In addition to reproductions, some old objects may be okay to continue using in these programs. Fully equipping historic environments with reproductions is not likely to be affordable for most organizations. Although those of us working for non-profits and public institutions are bound to preserve collections according to the best practices available within budgetary limits, some objects within the museum can be considered expendable. Kley uses the apt term “expendifacts” to distinguish such objects from those that require care for perpetuity. Staff should designate an education collection that includes both reproductions and expendifacts (some museums even track these categories separately). Accessioned objects should not be used up for programs unless first transferred to an educational collection, and the transfer process typically involves Board approval. Does it have a good story, especially one that relates to the institution’s mission? If yes, then the object should be accessioned or remain in the permanent collection and its handling limited. Could it be replaced easily through purchase? If yes, then the object may be appropriate for the educational collection. Is the object a machine or musical instrument that warrants (and possibly benefits from) periodic, limited use? If yes, and public program use is occasional, then it may remain in the permanent collection, as its use can be considered preservation-appropriate. How does your site handle using artifacts for public programs? How long does it take before the objects break down? We’d love to share your examples here! Often when we’re putting together sample supplies to hand out at workshops, we wish we had multiples of a fairly common item that we could use to store products with limited shelf lives. 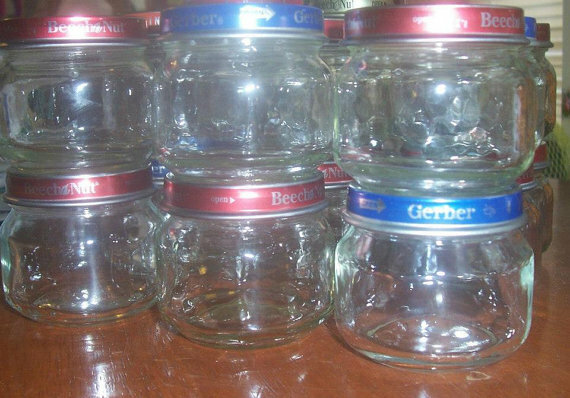 Clean glass baby food jars, for instance, would be great to store and/or distribute small amounts of Renaissance Wax, which dries out and hardens quickly in many types of plastic containers. These jars could also be good to contain silica gel beads. By piercing the metal lid with an awl, the gel could work within a microclimate (such as a storage box or exhibit case) to either dessicate or buffer relative humidity, depending the optimum environment for the artifact materials inside. The clear glass would allow quick visibility for color indicating silica gel, which looses its orange pigment upon becoming saturated with moisture. One museum audience engagement expert has remarked upon wish lists as participatory experiences. Collecting materials that would otherwise be cast off is an additional way for community members to contribute to your organization. Have you considered issuing wish lists for preservation and/or public program supplies at your institution? Several of our workshop partners and participants have had success collecting preservation and other supplies this way. Bob Hopkins, of the NC Transportation Museum and exhibits workshop instructor, maintains a wish list that includes empty pill bottles (with prescriptions removed for privacy). Volunteers bring these in for Bob to store variously gauged stainless steel mounting pins. Director of the Orange County Historical Museum, Brandie Fields, has engaged volunteers with collecting silica gel packets from their leather goods, pharmaceuticals, and electronics to donate as a preservation supply. Fields can bake the donated colorless silica beads at a low temperature to regenerate them and then mix them with the samples of orange-indicating beads she’s received at our workshops. In addition to babyfood jars, pill bottles, and silica gel, a preservation supply wish list could also include ethafoam. Electronics often come packaged with good ethafoam that can be carved into shapes for artifact storage or even display mounts. We want to avoid styrofoam, since it is not preservation appropriate, but the more malleable poly ethylene foam is normally safe (unless it’s light pink anti-static foam which contains residues that can harm some artifacts) and can be a great preservation tool. What other common products could be put to good preservation uses? What supplies have you had success collecting from your institution’s community?